Welcome Greyhawkers, today is the fourth installment of my new 5E Hold of Sea Princes reboot of the 2E modules Five Shall Be One and Howl From the North, set in the south seas. What sort of intrigue and escapades will the crew of the Sea Hag get into this week? Read on, and beware, this story may contain spoilers! When last we saw the questing crew was caught cowering from worm crawling cadavers. Leaving the cave and the undead burning in their nostrils, the party descended deeper into darkness in search of their prize. Perhaps emboldened by his near brush with undeath, Tyrrus led the way this time soon finding another rough cavern containing debris and a rockslide along one wall. Unfortunately two more of the fearsom worm-riddled zombies lurked here. With a yell and a charge Tyrrus led everyone in to gang up on them before they could react. One was hewn down swiftly, but the sight of the alien worms shook up Lash enough for him to withdraw to the rear with the mage Mallon. Cullen watched in desperation as one bony hand hit him and a worm tried with futility to gnaw into his skin. Ostyn rallied the group, waving a sword and torch soon setting the pair ablaze before they could regenerate their wounds. Sabriel the bard merely watched them fight, casually giving them a shrug of her shoulder. Sifting though the debris turned up a few valuables but the rockslide was clearly blocking something. Cullen was uneasy about opening another 'can of worms' so he put it to a vote. Mallon and a few others were keen on clearing the pile to not leave a stone unturned. Tyrrus' immense strength made the effort quick, and Lash was soon peeking into the darkness beyond:a short hall ending at a carved archway. Slipping into the breach first was the captain, Cullen. One step near the arch way he saw glowing runes appear on its surface. When he stepped back away they faded. Waving in Tyrrus and Lash, the pair rushed in before Mallon could appraise the situation and stop them with a warning. Glyphs flashed, acid sprayed and the two rolled and swiped as their clothes and skin burned and steamed. Kuma tended to their burns, but the others glared at them in concern, coming into a chamber beyond as the trap was already sprung. A small black sacrificial altar lay hidden here, remnants of bowls, knives and tapestries to a worm god were all that remained, rusting and rotting in the shadows. A lone skeleton remained with simple silver bracelet. Nearly done with the room, a loose stone was seen in the wall behind the altar. Again, the brawny fighter Tyrrus yanked it free and plunged his arm into the exposed space. The others waited for his arm to be lost and were underwhelmed to find it contained a quartet of potions and a solid gold idol of some Olman fire god that Tyrrus exclaimed must be worth hundreds of thousands of gold pieces. With the items in hand the group backtracked to the long corridor. The rough tunnel soon levelled out and became a worked hallway ending at two flimsy doors. Through the first they saw a room full of broken pottery and shelves. The red glow of magic light cast on Tyrrus' great sword soon attracted a throng of leering undead shadows out of the corners of the room. The incorporeal creatures chased the first few out of the pottery room, Ostyn bravely stood at the door trying to hold them off, but they amorphously went around him. Blades, arrows and spells flared at the shadows as they reached out with icy hands in an attempt to drain their strength. Their weapons seemed to pass harmlessly through their ghostly forms before one nearly grabbed Ostyn, yet he parried it with a scalding torch. Soon the magic of Kuma's faerie fire, Sabriel's swarm of magic daggers and a frenzy of skilled strikes eventually wiped the shadows into nothingness. Catching their breath, the group pressed on, Lash finally realizing from the day before that he could detect undead. Sure enough the presence of more living dead was ahead. Past a mosaic floored hall depicting Olman gods and littered with skeletons was a pillared hall ending at sturdy double doors. Before the door was another wormy-zombie standing in a quiet daze until light crept up on it. The presence of the thing chilled Lash yet again but the rest of the party had dealt with them enough by now and gang-whipped the thing into a pulp of rotten flesh and burned worms. Tyrrus, ever-brash kicked in the double doors with a surge of pent of strength and stumbled into a grand temple hall, shrouded in shadows but dominated by a central pile of treasure upon which sat a black dragon of indeterminate size. The thing had been awoke by the intrusion and the party stood awestruck for a moment until it hissed for them to "run away or die". Sabriel Loreweaver cautiously entered behind Tyrrus, who was now on guard facing the coiled dragon. The others however began to back away from the door, back within the pillared hall. Sabriel felt the urge to reason with the creature, a hand held out to use diplomacy with the monster. She inquired first, asking if it knew what the cursed black spot on her hand was. It snarled in the shadows and exclaimed that it was "it's a spot". Just then, another magical glyph on the wall behind the dragon began to glow, this time affecting the mood of some in the party; Sabriel sneered back and called it "the stupidest dragon". An insult that angered the dragon and it pounced! Cullen rushed in to the defense of Sabriel along with the ready sword arm of Tyrrus. Their first swings connected but struck lightly as it seemed the black dragon was not quite what it seemed, a blurry haze and translucent as the shadowy undead from before. Sabriel conjured a bright light in the center of the room to bring the beast's shape into starker contrast. It was indeed an actual shadow dragon. Ostyn and Mallon dashed in to aid their compatriots yet the enraged dragon swiftly breathed upon them with a mass of rolling, smoky, necrotic energy. Sabriel and Mallon screamed in pain as the other dodged to the sides. Lash feebly flung arrows at the creature and out of the corner of his eye he saw another draconic shadow lurking along the walls and creeping toward them. The second shadow-form breathed at Lash and Kuma sending the druid to the ground in seething pain but Lash saw through the illusion and was unharmed. Sabriel then utilized the missile bead necklace she had acquired from the pirate Anneka days ago. Flinging the explosive device behind the dragon it erupted in a ball of flame sending the dragon off-balance. The group rejoined battle with the creature, driving at it from all sides with swords, daggers and at a key moment Kuma called down a beam of moonlight to sear the shadowy monster's scales. The radiant energy had severely injured it at last. The dragon lashed out with teeth and claw, Ostyn selflessly drawing it's ire gaining scars in the process though his blades parried some of its necrotic touch. Sabriel turned the tide with a second bead of three from the necklace, again the explosion sent the monster tumbling to its stomach. Magical moonlight and stabbing blades rang at it until it stopped moving and even then a few extra stabs were given for good measure. The illusory dragon faded as well and the hall went silent, with the smell of charred shadow dragon in the air. The group spread out to sift among the treasure scattered about by the flailing dragon and exploding balls of fire, Mallon insisted they needed to find a sword among the hoard and they weren't disappointed for a rapier of white steel and set with moonstones was found on the ground. 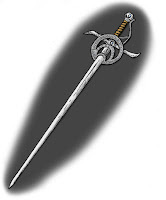 The group rested there, collecting all the dragon had formerly possessed, while those with the ability to study the blade soon discovered this was indeed the first Blade of Corusk, named Dreamsinger which glory-loving historian, Sabriel claimed was once held in ancient days by a Suloise bard named Kristin Permfors. Indeed, the blade seemed to call out to her, attuning itself to the next bard in a historical line of warrior-poets throughout history. Campaign notes: Spoilers of course! This fine blade is made of white steel with elaborate platinum filigree. Its basket and pommel is also set with polished moonstones. The blade was wielded long ago, by the prophetic bard Kristin Permfors who famously adventured with four other northerners. Aura of Protection. While you are holding the weapon, it grants a +1 bonus to Armor Class and all saving throws, except enchantments and illusions because of the strange mental effects of the sword. Spells. While the weapon is attuned to a bard or any class that uses Charisma for spellcasting ability, you can use an action to cast one of the following spells (save DC 15): augury and detect thoughts. Once you use the sword to cast a spell, you can’t cast that spell again from it until the next dawn. In addition, the blade grants the spell divination. Once cast, you can’t use this spell again until 7 days have passed. Firespear. This power only activates if the wielder of Dreamsinger or any of its sister-swords is in mortal danger. As an action, make a ranged attack against the target. A long spear of intensely hot fire is launched at a single target within 240 feet. On a hit, the target takes 6d10 fire damage. When the firespear is hurled from Dreamsinger, waves of melodic music cascade out from the sword in a 60-foot radius sphere. Treat the effect as a bless spell for allies, and a bane spell (DC 15 Charisma saving throw) for enemies that lasts for one minute. Good fun, and quite a haul!